This is a statement I hear over and over and over and over again. So, can I stress and say it again — people say, “I wish I’d started building my list sooner. Now in our five P’s, the third state is permission. We design a lead magnet. We design something irresistible that people think, “Oh I want to have that!” They give you their email address and you give them the lead magnet. Now when they give you their email address, they are giving you permission to market to them because you are not going to spam them. You are going to build a relationship. You are going to get them to know you and then they’re going to like you and then they’re going to trust you. Yes! That’s the way it goes and once you’re there, every now and again, you can make them a little offer. You are not going to abuse that position of course but this will get you more customers and this is the whole marketing process is to have a targeted audience to put your offers in front of. So that list — that is your ultimate targeted audience. So have you got a list building mechanism? No? I bet that you have got a list that you don’t know about. Yes! You have past customers. Now past customers ride a fine line with spam, by the way. Spam, I’m not going to give you the exact definition because it changes but spam is quite simply inappropriate and unwanted email. However, if somebody is a past customer and you were to send them a recall notice, say you’re Toyota, you’re not going to mind getting that even if you bought the thing five years ago so there is a fine line between being able to email people who have bought from you. There is a definition that Canadians came out with a lovely new law for spamming emails and it very clearly states that if someone purchases from you, then you have a certain amount of time where you can get in touch with them again but I want you to consider your past and current customers are people that are likely to not mind getting email from you. You may contact them and you can invite them to your lead magnet where they then come along and opt in so you can still ask them to lot opt in. 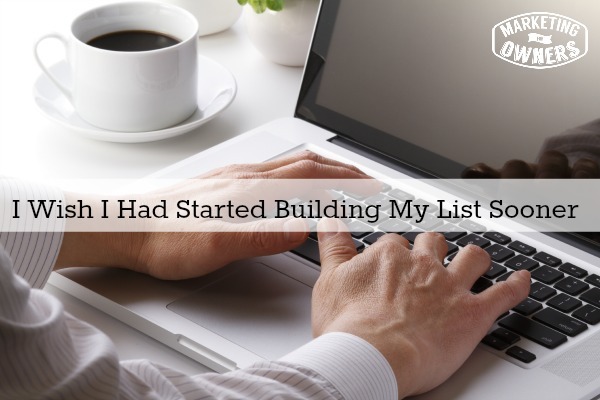 In fact, a lot of very successful list builders actually buy lists or rent lists in the same way that direct mailers do and they will email to those people on mass but they will email them an offer of a lead magnet with something to opt into. So that is not their list, they are kind of renting it. You send something to them and, of course, a tiny percentage of those people will visit/click through, visit their thing and think, “Yeah, that’s good for me. I’ll sign up.” That’s one way of doing it but everyone has to start somewhere. You only need to build this bit by bit. It will start to snowball. Eventually you will start to see things succeed and you’ll test and you’ll get better and better and better and figure out ways of doing it. You need to use something like “Mailchimp” or “Aweber”. We use Aweber, but others use Mailchimp and other owners use autoresponders and they say they get responses. Infusion sort of does an entry poll which is office pilot, and “mad mimi”, there is all sorts but of all of them,. I’ve used “aweber” for years and we use “Mailchimp” extensively as well in another couple of businesses. I’ve got lists as large as 32,000, and then I have lists around 10,000. These people that opted in were very low on subscribe rates and we email weekly so this does work. So, start building your list but instead of being overwhelmed, thinking oh that’s great he’s got my list of 32,000, we all have to start somewhere. It doesn’t matter if your list has 50 or 100 if they are targeted, they will still become buyers provided you nurture them correctly. So start soon. He publicly explains how he built his list, how he goes about it, how he plans. Now he sets something like a goal of so over the year he wants to build– let’s say he wants to add 3,500 email names to his list. Now that he would then reverse engineer that and he would say 3,500 okay that’s say 300 just cool it 350 front I couldn’t say so that’s 10 emails per day added every single day for a year will get him to his goal. Now he will say okay how can we get them if we get one new customer a day from whatever means that will be one if we can do guest post put out a guest post every week and that will get, on average, say 21. It is another three per day if we do Facebook ads strive them to that might get three a day and he will break it down to that level. So he aims for an amount and then he goes for it. And he at the end of every single week, he will review how many each little channel brought him. If one of the channels becomes more successful, he will put more emphasis on that or look at what worked for that and add it and try and incorporate it in the others. But build your list. Once you have that list, you send them auto responder emails, you write once. As long you’ve written them at least a day ahead of the first person signing up and do together they’re not going to get those emails on the first day, on the second day, on the fourth day, on the seventh day, on the tenth day, on the 14th day, on the 21st day, the 28th day and so on. These can be talking about something. So, say you sent them a downloadable report. You could tell them this — “Say on page three, did you see the thing? Here is a case study of how that works in practice. In that e-book, page 85, look at how I applied this to my business personally and how that got me “x” customers” – things like that. If any of you want to see what a lead magnet is go to marketingforowners.com/71. The number 71. That is a learning page. That is a lead magnet. That is a fabulous tool on our site that gives 71 tools of various stuff that I use every single day — trust me, every single day. Nice sales people that gets all our customers and we have a lot of customers. I apply that to all my businesses because it just works are those tools I just want to make. So go grab that and then you will find that you will get emails. You will get messages from us. Some of them will look personally to you like they’ve written personally to you. It works. This is a system that has been used year after year, not just by me. I didn’t invent it. I follow best practice and stuff that works. Go try that! Do it. Emulate this. Emulate it. Do it for you. Once you’ve got a list you can make them offers. They will become your lifetime customers and then you will preach us. Paul has done a fantastic study and the thing I like about it is he has, if I remember rightly, about a hundred examples of stories and how they are applied in real life in real businesses. He uses real business life examples. They are very clever. It covers something like 21 different industries or problems so there is going to be something for you in there. What you write in those emails when you are writing your web copy, you want to develop story telling as a talent. That book will tell you so. 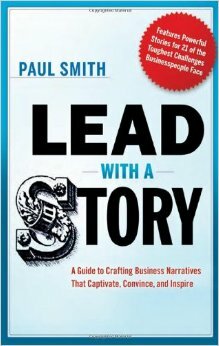 Lead with a story by Paul Smith. Audible, Amazon Book Depository, you name it, it’s there. You will find it. What do you need to do to your email list to get it up and running?